This opening C minor blues romp, Marcus explains, takes its title from two recurring characters on The Simpsons, “these green aliens with a glass dome over their single eyeball.” The tune summons a rousing performance from George Colligan on piano, Eric Wheeler on bass and Warren Wolf, better known as a monster vibraphonist, on drums. But this is just one of two quartet lineups Marcus employs on Inheritance; the other features Wheeler again with pianist Xavier Davis and drummer Eric Kennedy. 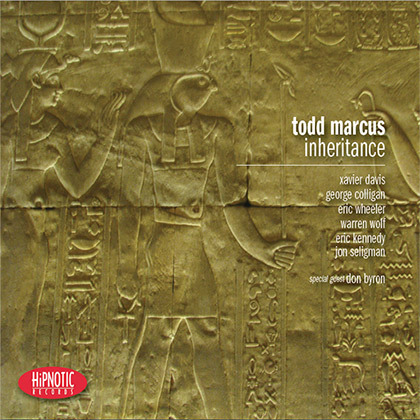 Another unique thing about Todd Marcus: he’s half-Egyptian on his father’s side, with a number of relatives still based in Cairo and Alexandria. The subtle Middle Eastern tinges in “Herod,” “Wahsouli” and “Blues for Tahrir” are no accident. Todd has investigated Middle Eastern music and his dual heritage in a variety of ways, and he’s paid close attention to the tumultuous events of the Arab Spring and the post-Mubarak era in his father’s homeland. With “Herod” he alludes to biblical times, opening with a stormy rubato introduction and seguing to a beautifully orchestrated feature for himself alongside clarinet great and special guest Don Byron. “There were a couple of tunes that called for a second voice, and I thought it’d be meaningful for me to have someone in the clarinet family,” says Marcus. “I’ve known Don over the years and he’s been such an inspiration for me, a major example of someone using the clarinet in modern contexts. We’ve done a few dates since the recording and we have some more coming up. It’s been special and it’s meant a lot to me.” The fact that both George Colligan and Xavier Davis have worked with Byron at various times made the match all the more comfortable. Byron returns for the extraordinary “Solstice,” which starts as a simple ballad and grows into a passionate multi-section epic. Far from distracting him from his music, Todd’s community activism only enhances his ability to connect, to see the bigger picture. “I don’t want to downplay the fact that music is a powerful force, something that can transcend a lot of the challenges that mankind creates for itself,” he says. “But the two halves of my life are equally important.” That, too, is part of one’s “inheritance” — the awareness that others have come before us, that others will follow after us, and that what we do in the present makes a difference. Music that’s informed by these human truths is bound to sound more multi-dimensional and alive, and it’s certainly borne out when Todd takes to the studio and stage. Stay tuned.